St. Paul, Minn. — The Twin Cities Komen Race for the Cure this Mother's Day raises money for breast cancer research. The Race for the Cure honors the women who have survived breast cancer and remembers those who did not. Events begin Sunday morning at Southdale Center in Edina. Minneapolis poet Betsy Brown's book, "Year of Morphines," preserves in verse her memory of two women who didn't survive breast cancer: her mother and sister. Cancer looms large in her family. Another sister has also been diagnosed with late stage breast cancer. Her father died of cancer, too. 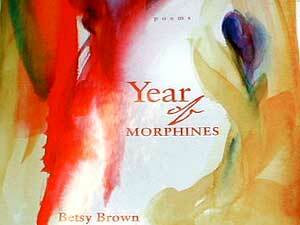 Betsy Brown completed the "Year of Morphines" after eight years of writer's block. She resumed writing following the deaths of her mother and sister. She spoke with Minnesota Public Radio's Mike Edgerly.